When you embark on our Upper River Rafting trip, you’ll journey 6.5-miles down class 3 and 4 rapids! Certified guides will navigate your raft throughout the entire trip, so there’s no need to be nervous. You’ll have the time of your life with plenty of surfing, big waves, and drops. Even if it’s raining, you’ll get to run about 70 rapids ranging from classes 1 to 4! Be prepared to be on the river for approximately 1.5 to 2 hours. Also, all rafters must be at least 8 years of age or weigh at least 70 pounds to participate. A Smoky Mountain rafting trip that your small group is sure to enjoy would be Extreme Upper River Rafting. This thrilling ride will take you along the Upper Pigeon River in a smaller raft with a maximum of 3 rafters and a guide for each. So, if you have a smaller and more experienced group, this trip is the way to go! On this adventure, you’ll be running go-for-it lines, hitting big waves, and surfing all of our favorite hydraulics! Please note that all rafters must be at least 12 years of age and be able to swim in order to participate in this rafting trip. Prior experience is not required but is recommended. If you have kids in your group and are looking for a trip with a little less speed, our Lower Pigeon River Rafting is a great choice! This 5.5-mile trip passes through the scenic Pigeon River gorge on the way to the Denton Bridge, and kids absolutely love it! You and your family will have a blast splashing water and enjoying the beautiful views as you float along. Enjoy the gorgeous sights of the Smoky Mountains while you travel down the river on one of our Smoky Mountain rafting trips. All of our rafting trips offer opportunities to take in the beautiful scenery. If you visit between March and April or after Labor Day, you can enjoy one of our most scenic adventures: our Natural Flow Trips. Since water levels can be somewhat unpredictable, you may have a leisurely trip down the river or an exciting ride down rapids! The number of people that can enjoy this trip together is adjusted according to the water level. Children must be at least 8 years of age or older to ride. Each of our trips offers wonderful views, so no matter which one you choose, you’re all sure to be amazed! 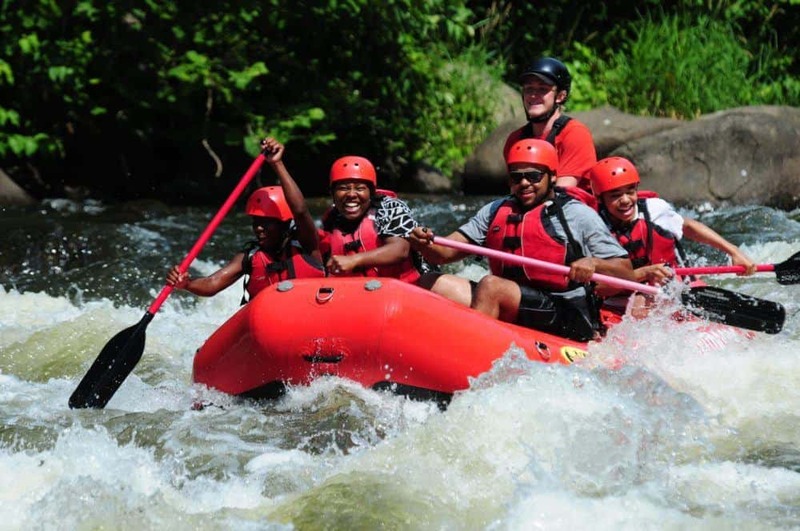 The only thing better than a Smoky Mountain rafting trip is saving money while you enjoy it! Special pricing and offers are available on a call-in basis for groups of 10 or more. So, you can get the most bang for your buck! You’ll simply have a better time knowing that you didn’t have to spend a fortune to have an amazing experience. Our Smoky Mountain rafting trips are extremely popular among groups, so reservations are highly recommended in order to ensure you get the trip you want. Learn more about why groups love rafting with us, then start planning your adventure!